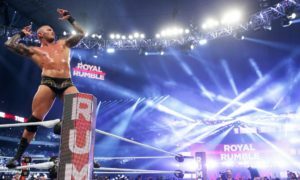 Randy Orton won one of the most predictable WWE Royal Rumble matches and will go on to WrestleMania 25. Coming in as the most predictable favorite, Orton eliminated Triple H to earn a title shot of his choice at WrestleMania. In contrast to last year’s WWE Royal Rumble, the biggest surprise came on the Royal Rumble undercard. As for the Rumble itself, it was probably one of the dullest Rumbles in history. I just found the match completely predictable and uncreative. Past Rumbles had really exciting twists and some unpredictable matchups. The only real surprise was the return of Rob Van Dam who entered the Rumble at #25. Otherwise, the Rumble was pretty bland in my opinion. The Rumble came down to the Undertaker, Big Show, Triple H, and the Legacy. Big Show and Undertaker wound up eliminating each other. Show was already eliminated when he took out Taker ala: Sid-Hogan. Triple H then eliminated Ted DiBiase and Cody Rhodes. Rand Orton was then able to sneak up behind Triple H and dump him over to win the rumble match. 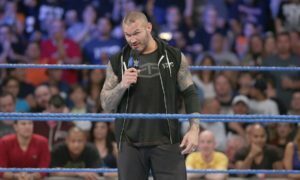 Randy Orton returns to the WWE title picture for the second year in a row. Orton defeated John Cena and Triple H in a successful title defense at WrestleMania 24. I think it is rather disappointing that the 25th WrestleMania is headlined by a match that we saw a year ago sans one wrestler. At the time I suspected that there was still something big in the bag, because Orton-Cena was not going to draw a monster buyrate on its own. HBK vs. The Undertaker would be the something big in the bag that would wind up stealing the show at WrestleMania. The big surprise on the Rumble came on the undercard. Edge regained the WWE championship by defeating Jeff Hardy. Most of us have been led to believe that Christian Cage would be a part of this match. Instead, it was Jeff’s brother Matt that would play a big part in the result. Matt turned on his brother, leveled him with a chair, and thus Edge took the pin and the title. I was really surprised by the angle, yet a few callers on my Pro Wrestling Radio radio show called this one over the last few weeks. This leads to a Matt Hardy vs. Jeff Hardy match at WrestleMania. The angle immediately brought into question the status of Christian Cage who had yet to debut, but was rumored to be wrestling Jeff at WrestleMania 25. The big irony here is that the angle resulted in Matt Hardy helping Edge win the world title. Many fans will remember the controversy between those two a few years ago regarding Edge-Lita affair. John Cena retained the WWE world title against JBL. Shawn Michaels played a big part in the finish as predicted in an earlier column by me that year. Michaels hit the ring after a ref bump. Michaels stared down JBL and hit him with some Sweet Chin Music. Michaels followed up with another kick to Cena and placed JBL on top. Cena kicked out, fought back, hit an FU, and got the 1-2-3. The match was much better than I had expected and had a ton of heat. Earlier in the night, the Undertaker and Shawn Michaels had a confrontation in the back. The confrontation teased a hopeful WrestleMania match. However, it looked at the time like Taker would be wrestling Big Show as a result of the Rumble. Thank God we weren’t forced to watch Michaels will put his streak of great WrestleMania matches on the line against JBL at WM25. As ridiculous as the storyline was, I thought HBK is did a great job of making it must-see television.